We've been spending more time exploring Flying Creatures of The Fifth Day. We have always been avid bird watchers, but it's interesting to learn so many facts about birds, through quality science texts, living books, and hands-on experiments. We sit together in short increments to notebook, read, or experiment. Many times it is unscheduled; maybe we have seen birds outside catching thermals and want to learn more. Maybe we are buzzed by the cardinals who live by our trashcans! Perhaps we've been sitting at breakfast and seen lots of birds at the feeders on the deck. The longer I educate at home the more I believe learning should be interest-led, child driven, and parent supported. It is our job to provide resources and a conducive environment for learning and exploring. Crinkleroot's Guide To Knowing The Birds - Do you know Crinkleroot? We've used him for other subjects, too! Peterson Field Guide Color-In Book of Birds - so detailed and full of information... a real masterpiece when a bird is colored by your child! A Nest for Celeste (not pictured, but read about our experience with this book here)- a beautiful living book about John James Audubon and his apprentice - one of our favorites! "Isn't it amazing that God created all of this? Isn't it a MIRACLE?" 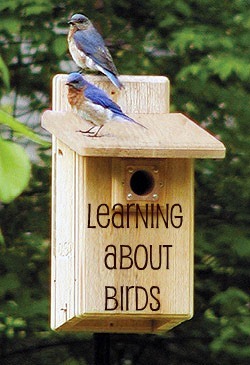 Do you have a favorite resource/activity for learning about birds?